There is such sensual pleasure in popping a thumb into the crest of a mandarin as you undress it of its peel; the release of its fragrant oils transporting you instantly to warmer climates. For these cakelets, however, mandarin oranges are sliced and boiled for a few minutes to soften and remove any bitterness from the rind. The act of baking does rather the same thing. When you immerse yourself in a recipe, worries are whisked away, thoughts are on simmer in the background, and your mood shifts noticeably. When you put love into making something delicious, you are transformed by the act. 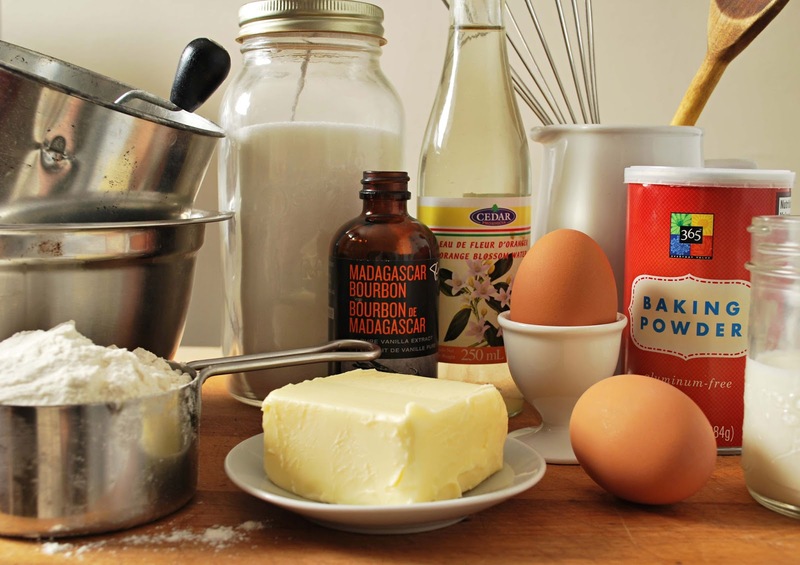 The cake batter borrows from my favourite yellow cake recipe, which combines the ingredients and kitchen prowess of two bakers I admire: Martha Stewart and Anna Olson. The cake lives up to its colourful name with the addition of the juice and zest of the mandarin, which gives it its golden hue. Buttermilk adds a bit of tang to the batter, while the subtlest drop of orange blossom water (a popular flavour found in Mediterranean and Middle Eastern desserts) lends its characteristic floral scent. The cakes puff up invitingly in the oven, filling your kitchen with a fragrance you wish you could bottle for future blustery days. The boiled orange slices are gently laid upon individual beds of bubbling caramel filling out the bottom of muffin cups. A generous scoop of zest-speckled batter is nested on top. 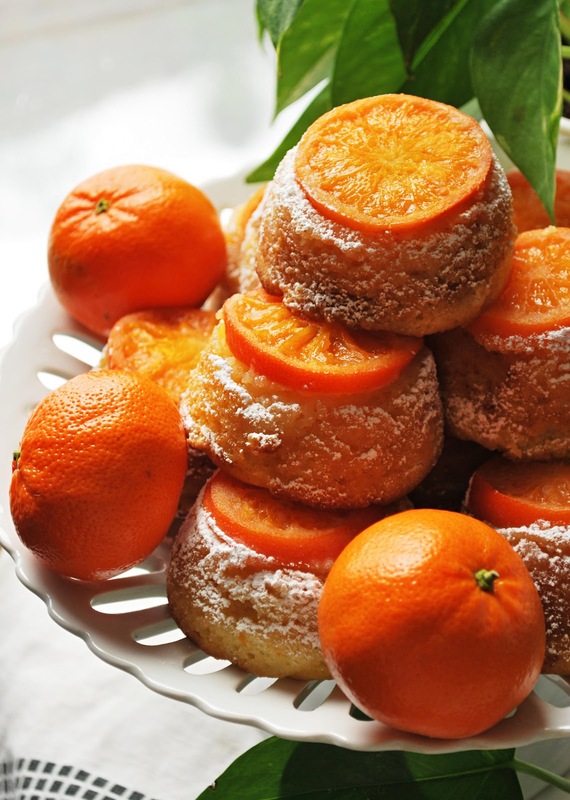 When you ease the baked cakelets out of their muffin tin and flip them upside down, the mandarin slices cling to the tops; flirty with orange blossom perfume and glistening with a caramel afterglow. With the candied mandarin tops protected by a spoon, you treat the side of the cakelets to a light dusting of confectioner's sugar. The spoon is lifted to reveal a glistening beacon of citrus. Just from looking at the cakes, you are immediately transported to the kind of place where the sound of the snowplow becomes the roar of the surf and the burst of heat from your floor vent could almost be mistaken for a warm breeze off the Mediterranean coast. When I made these, I indulgently scheduled a daily 'flight' from my counter-top until the last cakelet was gone. To book your own four-bite vacation, simply follow the recipe below. Thinly slice the mandarins until you have at least 12 uniformly-sized rounds (it helps to have more than 12 in case some fall apart after boiling). Boil for three minutes. Remove carefully with tongs and place on paper towel in a single layer. Cut 1/2 cup butter into 12 even pieces and set one piece in each muffin cup. Using a spoon, divide 1/2 sugar evenly between all 12 muffin cups. Place in preheated oven until butter is melted and bubbly (about 7 minutes). 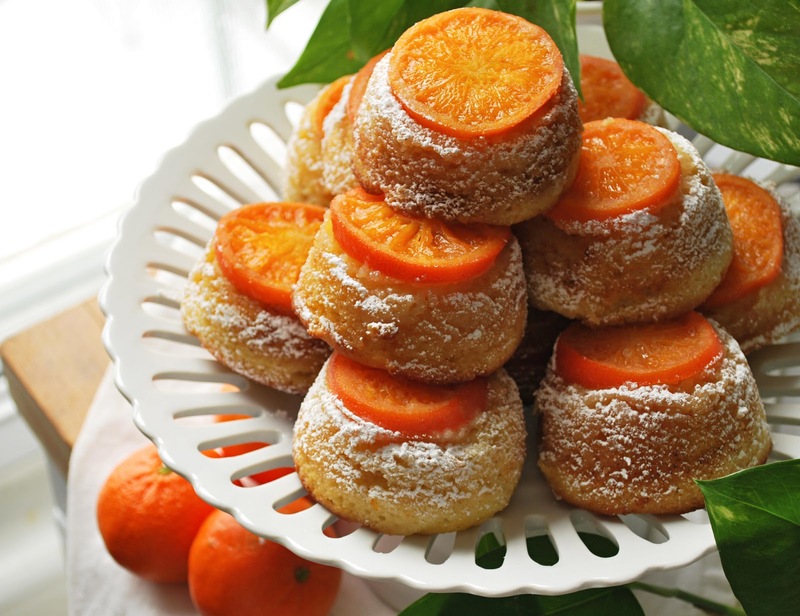 Remove from oven, and carefully place one mandarin slice on top of the sugar on the bottom of each muffin cup. Divide 2 tablespoons mandarin juice across all 12 muffin cups. In a bowl, combine flour, salt and baking powder. Set aside. In a stand mixer, beat remaining butter and sugar with the mandarin zest until light and fluffy. Add eggs, one at a time, allowing each to incorporate fully until adding the next. Mix in orange blossom water, vanilla extract, and remaining tablespoon of mandarin juice. Add the flour mixture to the bowl, alternating with the buttermilk until all is combined. Distribute batter evenly between 12 muffin cups (using an ice cream scoop helps with this). Bake at 350 F until puffed and golden, and a toothpick inserted comes out clean (approximately 20-25 minutes). Allow to cool slightly, then run a knife around the edges of each cakelet and carefully lift out of the pan and flip upside-down, so the caramelized mandarin is the top. 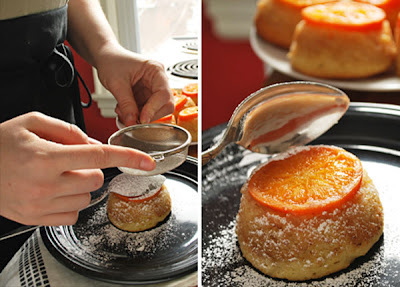 With a spoon, mask the mandarin slice and sift confectioner's sugar on the sides of the cakelet to decorate. Oh how sweet are these?! They sound lovely and look fantastic. Thanks Caroline - they are the perfect antidote to a long winter. I neeeeed a vacation and a tan. I'll settle for these...not that that is really settling. Best part about these? Each helping can be a different destination. I tried on, um, ... several. Oh, I want to be in the French Riviera now! I guess the second best thing is to be in your kitchen indulging in these cakelets (note the plural form). 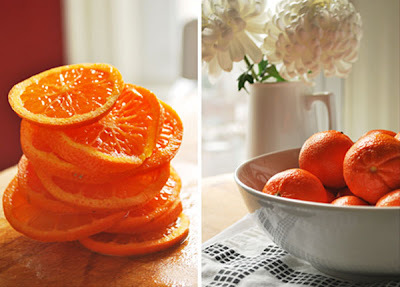 Since I am a big fan of mandarins (oh-so-sweet this time of the year) and I adore orange blossom essence or water, I have no doubt that these treats will bring me, if not to the South of France, to my knees! Oui, moi aussi! Plural form duly noted and heartily approved. I was just looking for a nice citrus cake. Thx! We would like to add your blog to the Top Food Blog list in www.mytaste.com/ . Your blog is impressively BEAUTIFUL and it deserves to be included on the Top list!! Great recipes!! We will feature your blog and we will make a lot of shout out about your recipes on our fan pages so that people and our 3million users worldwide will be able to check it on our site.